The first step to increase power and performance from modern engines is to help them breathe more easily and then ignite the fuel as quickly and fully as possible, and finally to remove the waste gases efficiently. Replacing the standard air filter with either a free-flow version or, better still, an induction kit, will help get the air in to the engine without obstruction. Last but not least... most induction kits will also create a satisfying induction noise particularly when the throttle is fully opened! 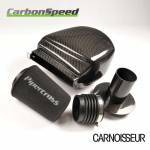 Carnoisseur have a full range of Carbonspeed Air Filters. To view the Carbonspeed Air Filters we offer simply make your selection below. You can purchase Carbonspeed Air Filters on-line or through our network of Carnoisseur Outlets. To find out more about Air Filters click here to view our Carnoisseur Air Filters Guide.